Another post from the surprisingly insightful editors at Huffington Post. Huff may not be your cup of team when it comes to politics, but they run some great articles on the subject of marriage. Even with the secular bent, there are useful tips here. 50/50 expectations inevitably lead to keeping score. We have argued here that a 60/40 balance, where each spouse is willing to give 60% in exchange for 40% (and an equity position in the marriage) reduces score-keeping which, in turn, reduces arguments over who is carrying the load and who is slacking. If your spouse is slacking big time–usually the husband, in my opinion–you need to address it, but in a friendly, non-confrontational manner. Courtship cannot end when she says, “I do.” Even in this age of liberated women (most of whom seem to be in their 40’s and older) husbands are well-advised to go the extra mile to keep the home fires burning, as it were. Planning and executing rejuvenating date nights is harder than it was pre-kids, but you need to do it anyway. And wives, please don’t forget that your husbands still relish the thought of being seduced by you every now and again. Just sayin’. Digging in when it gets hard. 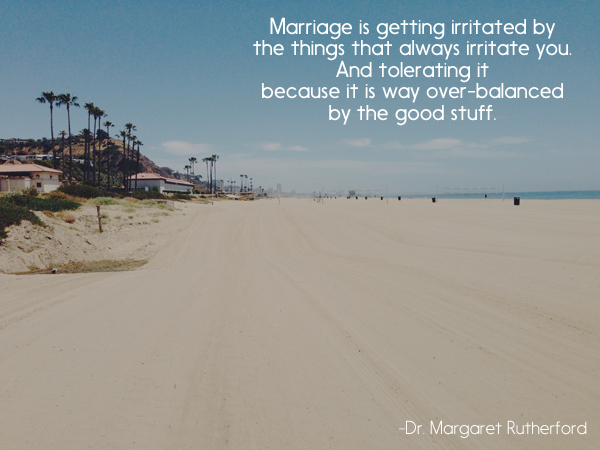 Marriage is pretty easy when things are going well, but when life throws us a curve or, worse yet, a beanball, couples need to lean into one another with resolve to weather the storm. This compares to a previous essay describing the attitude of millennials toward marriage, in which it seems preferable to be able to just wash one’s hands and walk away into a new relationship. Being here now–proximity does not equal presence. If the two of you spend your time at a romantic little restaurant on your phones, you’re missing out. Establishing boundaries, such as turning off your phone when you get home from work, will enhance the intimacy in your relationship. The job stuff will always be there tomorrow; the same cannot be said of your spouse. My wife Nancy facilitates Bible study and recently drew a comparison between attendees who consume Bible study versus those who create it. Applying the same contrast to marriage, if we are to manage a successful long term relationship we must do more than simply consume the benefits. We must create, through curiosity, conversation, comfort and consideration, an environment in which both spouses enjoy the pleasures of an intimate relationship with one another. Guys, here’s a news flash–being happily married is not simply her job. As Christians, we are called to forgive one another, even our enemies and those who wish us harm. Forgiving one another, graciously and completely, is an important element of marriage. If we are to forgive sworn enemies, are we not to forgive our best friend, our closest confidant, our lover and life partner? Some marriages, in which cheating, lying, addictions and violence are routine, may exist outside the boundaries of forgiveness, in need of dissolution/annulment. But in the majority of marriages, we should emulate God, be slow to anger and quick to forgive. Valentine’s Day is coming soon. What are YOU planning to show your spouse how much you love being married? Our most recent post was an unsettling look at marriage from the perspective of people in their 20’s, the so-called Millennials. It talked about “beta testing” relationships, about seven-year options with the right of renewal, etc. Worth reading, if you have the time. Today’s post examines marriage from the perspective of couples who have been married up to 76 years. The original article, written by Nancy Hellmich, appeared in USA Today. Follow your heart when choosing a spouse. This was beautifully described as “the thunderbolt” in The Godfather, whose Michael Corleone experienced it while courting his future wife, Apollonia Vitelli, but I digress. The point is, one shouldn’t get married simply because it seems like the right time. He or she must make one’s heart “soar like a hawk.” And although young love is no guarantee, perhaps we should describe it as necessary, but not sufficient. Use your head, too. If he or she has a gambling issue or drinks too much, is financially irresponsible or flirts incessantly, it raises the odds against a successful long term union. Our future mate need not be perfect, but there are some definite dealbreakers out there that all of your love and care won’t overcome. Seek shared values. Sure, opposites attract, and spouses with different temperaments can enjoy very successful long term relationships. My wife Nancy and I are different in many ways, but we share core beliefs in raising children, handling money, deferring immediate gratification to achieve long-term goals, etc. In college, I thought of this a seeking a woman with a “coefficient of boredom” similar to mine, one who could enjoy life at a pace midway between frenetic and lethargic. Find someone with whom you can communicate easily. It is unrealistic to suppose that Chatty Kathy is going to be able to sustain a relationship with Strong Silent Ken. I’m big and loud and still recall how happy I was to have met a woman in Nancy whom I could not intimidate. Back when I was in the insurance business I had a client with a basic high school education who operated a food truck and was married to a pediatrician. I don’t know what became of them, but I remember thinking at the time that they didn’t seem to have much in common. If you and your intended have trouble talking about important stuff now, it probably won’t get any easier as you age. Put your relationship first. Ahead of your family, your kids and your friends. Ahead of your work, your hobbies, even your favorite NFL team. If your spouse feels you care more about golf than you do about her–even assuming she’s wrong–there’s gonna be trouble in River City. Just sayin’. And, like it or not, your kids should have to fit in your lives; you should not have to build your lives around them. Just because you would give your lives for them doesn’t mean you should, unless push comes to shove, which it rarely does. Develop some ground rules around in-laws. They can enrich your lives, they can become a burden, or some of each. The important thing is to find common ground concerning when, where and how much time you spend with them. My mom told me to check out a girl’s mom, because that was who she would someday become. I could argue that perhaps Nancy should have taken a closer look at my father, since he’s who I have become. And though these prescriptions are offered somewhat tongue-in-cheek, there is something to them. Pillemer says that “marriage is made of thousands of micro-interactions” which John Gottman refers to as “bids” in his own research. It is hard to give one’s wife too many compliments, indicating not that you are a fawning dolt, but rather that you notice and appreciate the small things she does for you. If your love language is acts of service (as mine is), it’s nice when they are noticed and received graciously. Maintain your physical relationship as you age. Not doing so puts you at risk of developing a spiritual distance between yourselves. As Toby Keith says, “I ain’t as good as I once was, but I’m as good once as I ever was.” Even if you’re beyond Toby’s stage, it is important to maintain physical intimacy in your marriage. Pope John Paul II’s “Theology of the Body” proclaims that marital intimacy is a gift from God, and we should treat it as such. Finally, it is important to be friends first. This doesn’t come from Pillemer, but from me, John Gottman, Art and Larriane Bennett and countless students of the game. Can you imagine an argument with your best friend that would cause the two of you to stop being friends? Me neither. So it stands to reason that if your spouse is your best friend, you can weather any number of storms in your relationship, knowing that you’ll make up and find a way to laugh off whatever it was. If you’re just lovers, you might choose to walk away from each other when things get rough, as they will. Being friends first gives you a powerful motivation to solve problems, soothe feelings, and put things right.